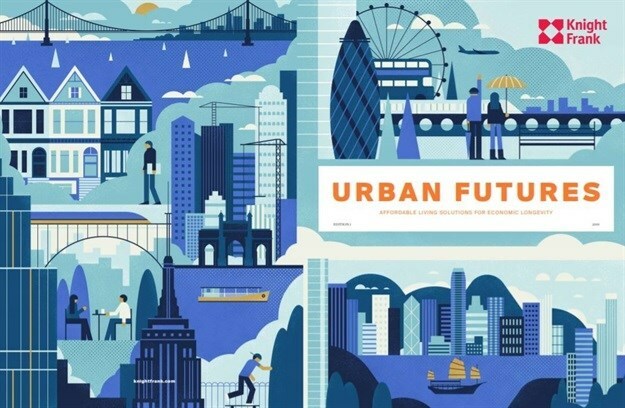 Knight Frank has released its inaugural Urban Futures report which has found that the affordable housing gap - as measured by the difference between house prices and income - reached an estimated $740bn globally in 2018. Rapid urbanisation: According to the UN, 55% of the world’s population lived in urban areas in 2017, up from 42% 30 years ago. This is expected to rise to 68% by 2050. Housing as a commodity: Since the financial crisis, housing has shifted to become a complex investment vehicle attracting huge sums from funds and corporations. Politics: The need to create more affordable housing is matched by governments’ desire to raise revenues. Supply: Land supply issues resulting from regulatory constraints. 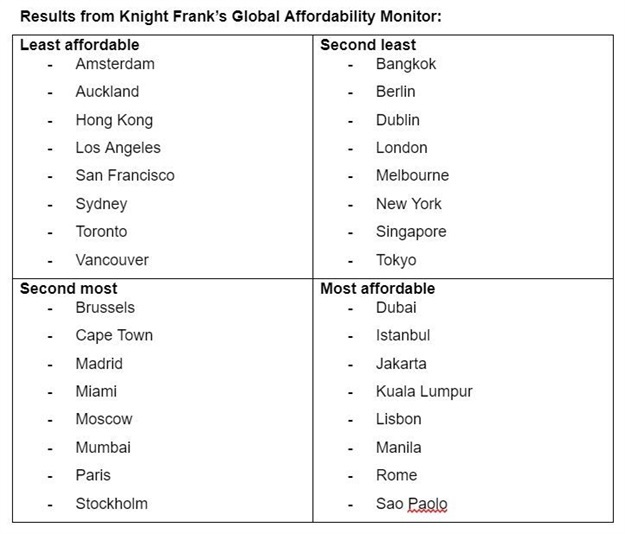 As part of the report, Knight Frank has launched its Global Affordability Monitor, which analyses affordability across 32 cities. It takes into consideration three key measures – house price to income ratio, rent as a proportion of income and real house price growth compared to real income growth. Some cities bucked the growing disparity trend; New York saw its income growth exceed real house price growth by 3%. Moscow, Singapore, Mumbai and Paris also saw their average real income over the last five years grow faster than real house prices. Moscow saw the largest difference where real income growth outpaced real house price growth by 22%. Amsterdam, Vancouver and Auckland saw real house price growth outstrip real income growth by 59%, 46% and 32% respectively making these cities some of the least affordable. Affordability in Jakarta and Kuala Lumpur remains a key issue, despite the cities falling into the ‘most affordable’ quadrant. Developers are reducing the size of new residential units to maintain maximum capital value at accessible levels. Co-living: A concept on the rise in many global cities. Corporates entering the development space: Facebook’s Menlo Park development consists of 1,500 housing units. Public private partnerships: For example Transport for London aims to play an integral role delivering affordable housing that prioritises quick delivery and multi-tenure options. Cooling measures: Implemented to slowdown the property market in cities like Hong Kong. These have had a limited effect, but the recent implementation of higher interest rates and a weakening economy led by a falling stock market may change this. Sustainable micro homes: These homes, such as the OPod Tube Housing project, are becoming increasingly popular as a result of affordability pressures, but their impact has been limited. Reclaiming land: The Hong Kong government is actively trying to extend the amount of land it has to build on by reclaiming land to create new islands. Floor space regulations: If the government were to lift floor space regulations in Mumbai, developers could build vertically, alleviating the pressure for space in the city, whilst increasing supply. Better, faster transport: Reducing commuting time would enable citizens to commute from further afield, potentially reducing high price areas and increasing the standard of living for commuters from satellite towns.